I first set eyes on Lake O’Hara way back in 1991. It was the last day of July. It snowed. I was there on a whim, having heard about this beautiful place in the Canadian Rockies, travelling with some friends on an extended backpacking trip. We were looking for magic. We found it at Lake O’Hara. Since that first delirious visit, I have returned again and again, drawn to the sublime beauty of this wonderland within Yoho National Park. 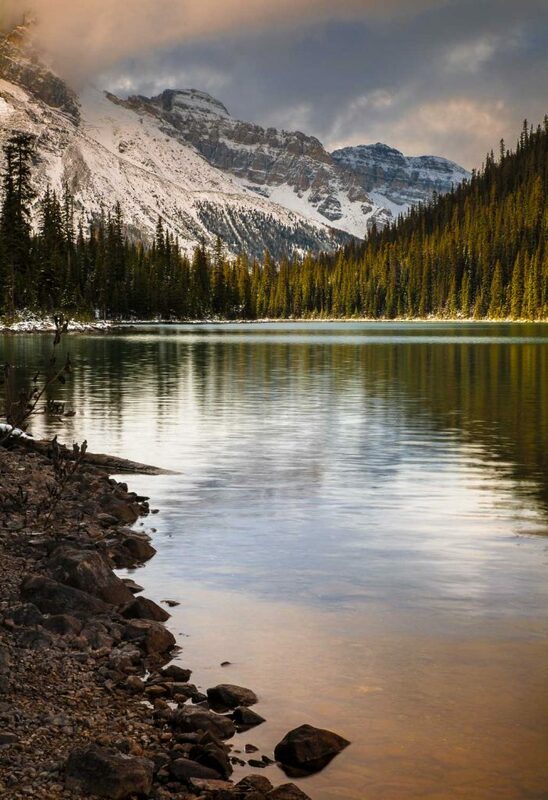 The Canadian Rockies are, of course, justifiably world-famous for their astonishing beauty. They eclipse the American Rockies in scale, grandeur and painterly allure. I’ve visited in every season and have found ecstasy in each one, but autumn at Lake O’Hara is in a league of its own. 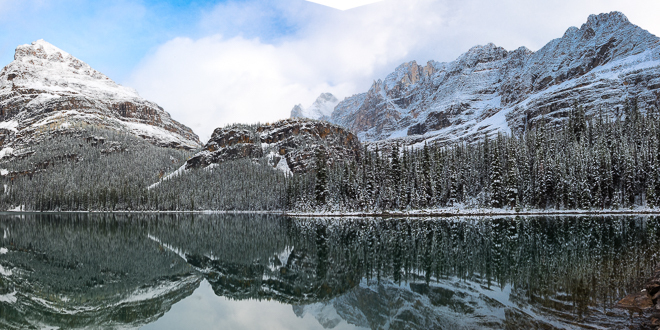 The lake itself is a study in subalpine elegance, a comely body of turquoise water surrounded by the kind of epic peaks that define this UNESCO World Heritage Site. The colors are magnificent. I’ve long been a fan of the autumnal mardi-gras color show put on by larch trees and this spectacle reaches its zenith here every September when the larch forests glow with an orange light warm enough to make you forget about the cold wind that blows down from the glaciers. I have spent a lifetime seeking mountain beauty: a wild-eyed pilgrim in the Cascade, Sierra, Alaska, Coast, St. Elias, Brooks and other ranges. I have found myself enthralled at the base of Mt. Monolith in the Yukon’s Tombstone Range and have danced among the aspens on Utah’s Boulder Mountain. 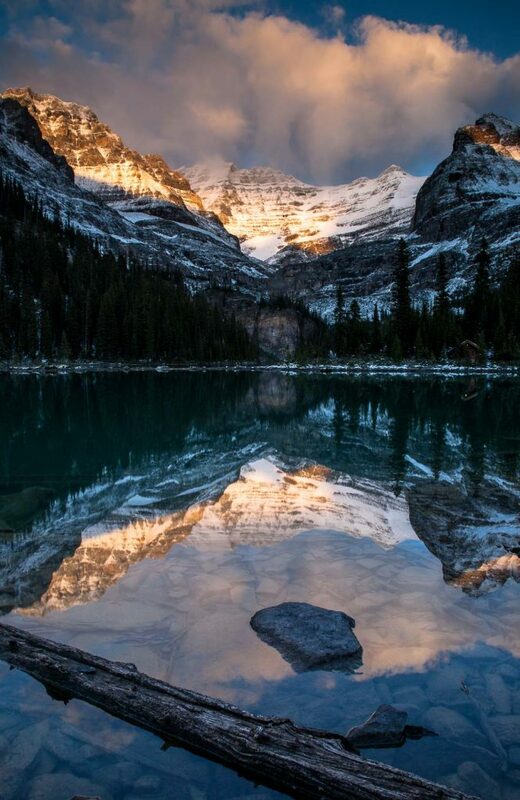 But when it comes to classic mountain beauty, the Lake O’Hara area is a study in the sublime, a perfect combination and arrangement of elements: lake, forest, meadow, mountain, glacier, sky. From the lake, a series of trails radiate outward and upward, conveying the supplicant to a variety of remarkable destinations. In each case the journey is as rewarding as the objective: hiking these trails is as good as hiking gets. They are expertly constructed—equally practical and poetic—and deliver hikers to countless variations on a theme of mountain splendor. And yes…the larches. How to describe them? Imagine forests—vast and delicate—emanating light, illuminating the shadows. The kind of storybook woods that are home to imaginary creatures, all of them friendly. The forest of your childhood imagination. But getting here is not easy. Sure, visitors are transported by bus to Lake O’Hara (no private vehicles, thank God) and from the lake, the trails pose no undue challenge in terms of effort or stamina. The hard part is to secure a ticket on the bus and a campsite at the walk-in campground, from which you can explore the surrounding area. Not easily done. The enlightened folks at Parks Canada have wisely restricted access – otherwise, Lake O’Hara would have been laid waste years ago like so much else. Bus and campsite reservations are made available 90 days in advance. They sell out within hours. Fortitude is required to procure a reservation. Apply yourself. You’ll find dramatic mountains, their faces striated and streaked with snow; aquamarine lakes; iridescent blue glaciers; roaring waterfalls; vast wind-swept meadows; the occasional bear, moose, mountain goat, or Rocky Mountain Bighorn Sheep, curved horns suggesting the architecture of the Norse Gods. Thanks to the northern declination, all of this wonderment is bathed in an incandescent golden light, the lighting scheme of a Maxfield Parrish painting. But be forewarned: the height of larch season is also the season’s turning point and snow is not uncommon. Bring traction devices for your feet—yaktrax or micro cleats—they’ll quite likely come in handy. From a base camp at the Lake O’Hara Campground (or the nearby $1000/night Lodge) four separate alpine areas vie for your attention, each reached via a spectacular trail system. 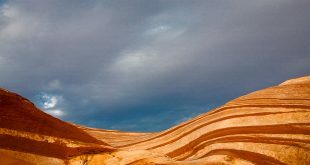 The ultimate experience, one of the premier hikes on Planet Earth, stitches together several of these trails on the Alpine Circuit, a grand loop of extraordinary beauty and drama. Climb stone steps to a realm of austere beauty and wind-swept magnificence. Literally, the Stairway to Heaven. Lake Oesa is surrounded by massive 11,000+ footers: Mt. Victoria (11,362), Mt. Lefroy (11,227) and Mt. Huber (11,047). This is an excellent introduction to the wonders of the area. A wild high lake cradled in a bowl of shattered rock and lingering snow, MacArthur feels remote despite its proximity to Lake O’Hara. Across the lake, a glacier spills down from Mt. Biddle (10,886). I’ve circumnavigated this, the largest of the lakes in the Lake O’Hara area, but it’s no walk in the park, requiring semi-exposed scrambling on the steep slopes and cliffs that rise as much as 2,000 feet above the shoreline. The trail to MacArthur passes through sublime larch forest. This high vantage on a shoulder of Odaray Mountain offers a view out over the entire Lake O’Hara area from the 8300-foot Odaray Grandview Prospect. Especially beguiling are the postcard views of Cathedral Peak (10,456) and the Goodsir Towers (11,703). 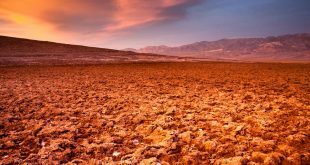 This is rock and scree country. Bring warm layers: the wind means business up here. The trail to Odaray is prime grizzly habitat and Parks Canada limits the number of parties that can hike here each day (before August 15, access is limited to four groups per day, two groups per day between August 16 and September 15, and back to four groups thereafter). A logbook located at the junction of the Highline Trail will let you know how many have passed through previously. 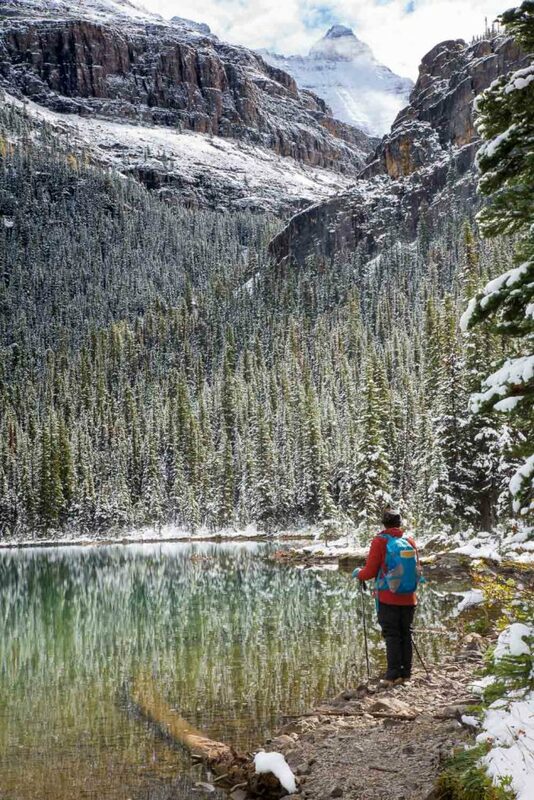 A gentle exploration of sweet little alpine tarns beneath towering walls, the Opabin Circuit is perhaps the easiest of the hikes in the Lake O’Hara region. Once atop the plateau, the trail winds through meadows dotted with larches to Opabin Lake at 7500 feet, set like a jewel beneath Yukness Peak (9354). 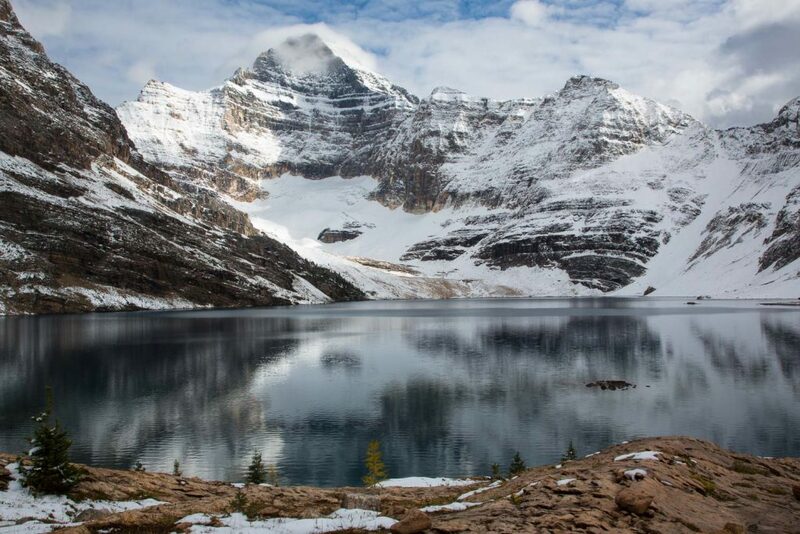 Don’t miss the Opabin Prospect, with its birds-eye views over Lake O’Hara. Few hiking routes offer the kind of non-stop awe available on the Alpine Circuit. This route (and it is (ITAL) a route, stitching trails together and including some very airy quasi-scrambling) transports hikers through a realm of high-mountain glory that beggars the imagination. Begin with the stiff ascent to 8315-foot Wiwaxy Gap and dispense with the steepest section right away. There are many places where exposure is significant along the circuit as the route traverses ledges where a misplaced step would have very serious consequences. Definitely not a hike to consider in bad weather. From Wiwaxy, follow ledges of Mt. Huber to Lake Oesa, before crossing the infamous Yukness Ledges to the Opabin Plateau. From here, pick up the All Souls’ Alpine Route which climbs to All Souls’ Prospect at 8118 feet (superlatives fail to describe this viewpoint) and then down to Schaefer Lake and back to Lake O’Hara. 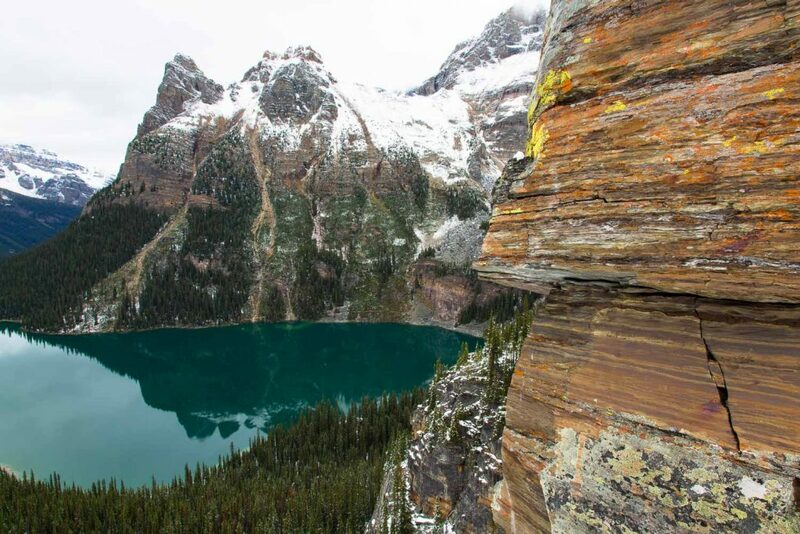 The trail system at Lake O’Hara is an engineering marvel, granting easy access to the wonders of the alpine. We can thank Lawrence Grassi, a retired coal miner, prolific mountaineer and passionate lover of the mountains for his dedication and artistry in constructing many of these amazing trails during the 1950’s. Born Andrea Lorenzo Grassi, he immigrated to Canada from Italy in 1912 and eventually settled in the Bow Valley in 1916 to work as a coal miner. He arrived at O’Hara in 1946 and served as assistant warden (ranger) over the following two decades. Grassi single-handedly constructed many of the trails, moving immense rocks to form great stone staircases that represent the pinnacle of the trail-builder’s art. 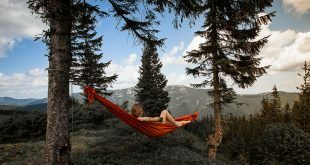 By all accounts, he favored simplicity and solitude, living alone in a simple cabin and savoring the beauty of the Rockies. He died in Canmore, Alberta in 1980.